If you read our post earlier today, you know that we are currently in LA, and last night we went to the Santa Monica Food Truck Bazaar. We met Ross from Roaming Hunger there, and the first food truck he recommended trying was the India Jones Chow Truck. India Jones Chow Truck won the 2012 LA Vendy Cup, and we had a chance to chat with Chef Sumant for a little while last night. He is on the Board of the Southern California Mobile Food Vendors Association, similar to the NYC Food Truck Association here. Chef Sumant also has a Chinese food truck called China Jones Chow Truck, and he told us about an idea he has for a third food truck, but swore us to secrecy. Sorry! Ross said we had to try the Lamb Frankie, which cost $6. Let’s rock & roll! The India Jones Chow Truck had 4 different curries last night, including veggie coconut and dal, two vegetarian options. There were also a few choices for stuffed paratha, samosas, and frankies. You can see the full menu here. We haven’t seen frankies on the streets of New York, although there seem to be a few similarities to kati rolls. At the India Jones Chow Truck, you can get lamb, chicken, beef, shrimp, paneer or mushroom & cheese as the filling. The woman on line before us ordered her lamb frankie spicy, and we did the same thing. The lamb stood up well to the cilantro tamarind chutney and the hot sauce, which was quite spicy. There were also a few chopped onions, and scrambled eggs. Surprisingly, the egg was more apparent to us in taste than the onion. It all came wrapped in roti bread, which was soft, but still had some crispiness to it. The roti held everything together nicely, although it was wrapped in paper for extra reinforcement. Without the paper, it could have been a lot messier. 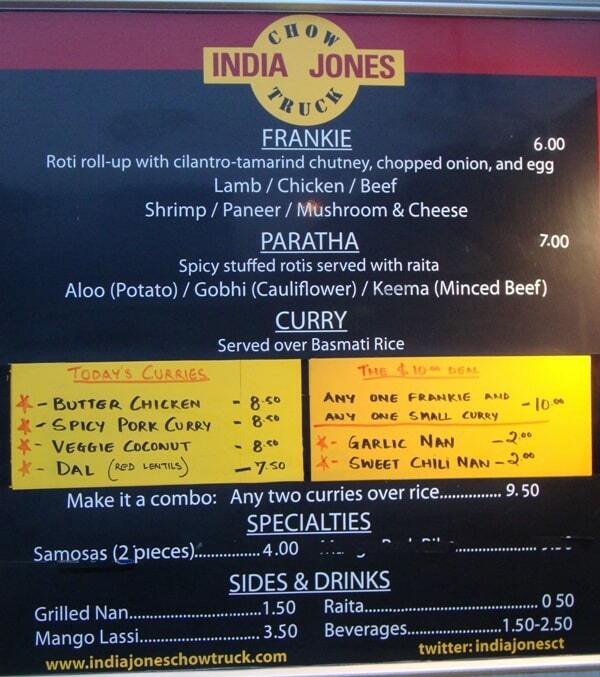 If you’re in LA, we suggest you check out the India Jones Chow Truck. They can be found on twitter here.